Type 6902C HiFlex Petroleum Suction Hose is a highly flexible hose designed for use with gasoline, diesel, and fuel oils. This petroleum suction hose, or tank truck hose, is compatible with many bio-diesels and ethanol based green fuels (Note: switching between fuel blends may decrease hose life). The nitrile rubber tube is formulated for 55% aromatics, while the HiFlex corrugated cover offers maximum flexibility and is ozone and weather resistant. A high tensile spring wire* offers full vacuum, durability, and a means for grounding the assembly. 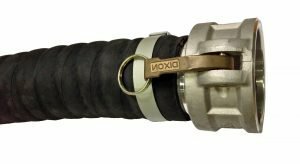 Tank truck hose is available in additional styles including a smooth cover (Type 6902), a sub-zero service grade, and in a 300 PSI grade (some sizes). Suitable for many biofuels to B20 in dedicated service (to B100 by special order).